Abstract: This study quantitatively evaluates the tumor cell targeting capabilities and intracellular uptake pattern of Chlorotoxin (CTX) when delivered intratumorally (IT) and intravenously (IV) using subcutaneous (SC) U87 human glioblastoma mouse model. CTX is a scorpion derived polypeptide that selectively binds to tumor cells of neuroectodermal origin, such as glioma and a wide range of other tumor cells, but not normal cells. The quantification of CTX cellular uptake presented here will assist in the further development of our tumor targeting drug delivery system (DDS) consisting of a chemotherapeutic encapsulated in non-ionic surfactant vesicles embedded in a thermosensitive cross-linked chitosan hydrogel, which has affinity for MUC1 receptor overexpressed on many tumor cells, including low-differentiated glioma. CTX addition to the DDS will serve as a second tumor targeting molecule. cm3, mice were injected either IT or IV (tail vein) with 50 μl of 100 μg CTX or phosphate buffer saline (PBS) as a control. The tumors were harvested at 5 minutes post IT injection or 7 hours post IV injection, fixed, sectioned at 5 μm, and followed by either immunofluorescence or immunocytochemistry using anti- CTX primary antibody and AlexaFluor-594 conjugated secondary antibody or immunoperoxidase- AEC kit, and evaluated by confocal or scanning microscopy, respectively. CTX levels were compared between three different tumor regions (A, B, and C; A = injection site marked by methylene blue dye, C = most distant from injection site, B = equidistant between these two) after direct IT injection and compared to CTX levels in tumor tissues following IV injection. 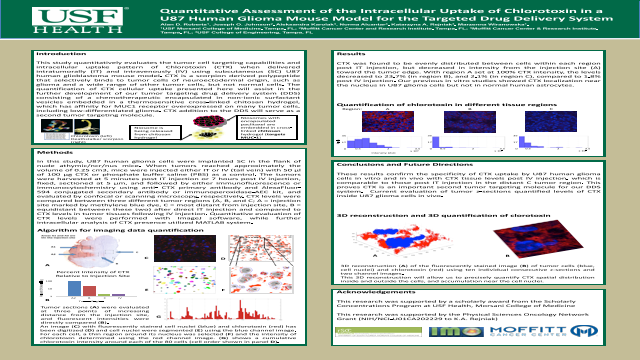 Quantitative evaluation of CTX levels were performed with ImageJ software, while further intracellular analysis of CTX presence utilized MATLAB system.